In 1910 Go Hip King applied for admission to the U.S. for his minor son Yao Chow or You Chow (You Choi). 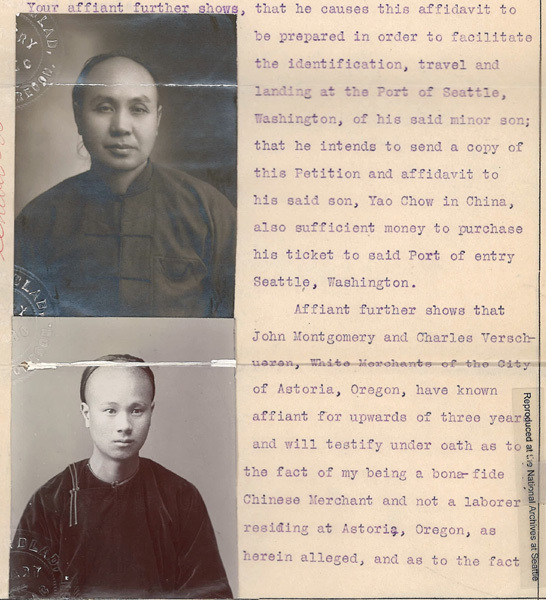 “Affidavit photos of Go Hip King and You Choi,” 1910, Chinese Exclusion Act case files, RG 85, National Archives-Seattle, (Go) Yao Chow (alias Go You/Yow Choi) case file, Portland Box 7, file 1949. Go Hip King’s interview did not go well. He admitted that two members of his firm were laborers not merchants; that he had attempted to have attorney Hemple bribe an immigration official; and that although there was an accusation that his rental property was being used as a place of ill repute he did not know what kind of people lived there. There were many discrepancies between the father’s and his alleged son’s testimony. The 1910 application for admission under the name of Yao Chow and was rejected; he appealed but withdrew his appeal the next day. You Choi (Yao Chow) tried again the following year. In June 1911 You Choi, age 19, married name Go Kum Lun, arrived in the Port of Seattle. Transcripts of translated letters from Jue Shee, Go Hip King’s wife and from his sons, Yow Choi and Yow Lee, are included in the file. Edward E. Gray, Go Kip King’s attorney in 1911 reviewed every item of contention in the 1910 case with the Immigration Commissioner trying to show his client in a good light. Gray said that Hemple, Go Hip King’s previous lawyer convinced Go that paying off an official was a necessary part of business. Witness John C. Montgomery, who worked in a plumbing and tin shop, testified in July 1911, that he was born in Astoria and lived there forty years except for ten years when he was away. He had known Go Hip King for over six years, saw him on a regular basis as manager of his store, and didn’t think he ever worked as a laborer in a cannery. Attorney Gray thought that You Choi was the innocent victim of his relatives and friends who mixed up the records so much that it was hard to ascertain the truth. Once again, You Choi was rejected; his case was appealed, and the appeal was dismissed. He was sent back to China. There is no more information in the file.